Dr. Stefan Koelsch, born 1968 in Texas (USA), studied at the University of Music and Arts Bremen music (violine, piano and composition) and at the University of Leipzig psychology and sociology. 2000 he received a PhD in psychology at the Max Planck Institute for Human Cognitive and Brain Science Leipzig and habilitated 2004 at the University of Leipzig. 2001/02 he was post-doctoral research fellow at the Harvard Medical School (Boston, USA). 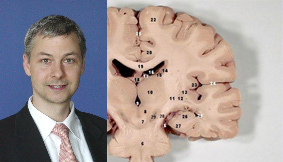 2003-07 Stefan Koelsch was leader of the Independent Junior Research Group “Neurocognition of Music” at the Max Planck Institute for Human Cognitive and Brain Science Leipzig. At the moment he is Senior Research Fellow at the University of Sussex. The main focus of his research lies on neurocognition of music and language; music and emotion; developmental aspects of language and music cognition; emotion and its effects on autonomic, hormonal, and immune function.